At Washington, D.C.’s barmini, the bar and cocktail lab adjacent to José Andrés’ molecular gastronomy restaurant minibar, Coronado’s cocktails blend flowers and citrus fruits with spirits (typically gin or vodka) to evoke the blooming-nature of the season. Take chamomile, for instance, which adds a natural honey characteristic, perception of sweetness and the fragrance of tea to libations like the Essential Pollen, where it mixes with honey vodka, lemon and egg white. Lavender is another ingredient that can deliver perfumed notes to cocktails, but its overtly heady nature is best in small doses. “Lavender can bring beautiful notes of both purple flowers and bitter rose with a woodsy structure akin to rosemary,” Coronado explains. 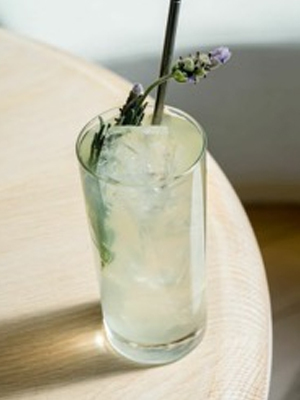 His Aroma Therapy shakes St. George Terroir Gin—a woodsy, forest-driven spirit from California—with lemon, simple syrup, Dolin Blanc Vermouth and lavender bitters, topped with soda and garnished with a sprig of fresh lavender. The drink’s name is a nod to the therapeutic benefits and calming aroma for which the purple Provence flower is touted. Orange blossom lends a delicate flavor that can be very different from the fruit’s juice or peel; Coronado especially likes to add it to creamy cocktails like Flips and variations on the Ramos Gin Fizz, where its zesty nature can offset richness. He uses orange blossom in the Juana Giallo, where egg, cream, saffron, Galliano and green and yellow Chartreuses combine to create a sip with multi-dimensional vegetal and floral notes. Perhaps the most eclectic spring sprout at barmini is made by dehydrating hay and citrus peel until it literally turns to ash. “Since we do such a slow process, we retain the brightness of the citrus as well as some of the earthiness of the hay, and the finished product is bitter, bright and floral.” Hay ash is added to Dark Side of the Moon with Old Tom Gin, Crème de Violette, lemon, egg white and citrus. Add all ingredients except soda water and garnish to a cocktail shaker. Add ice, and shake until chilled. Strain it into a cocktail glass, top with soda and garnish with lavender flowers. Muddle star fruit in a cocktail shaker. Add the vodka, elderflower liqueur and lemon juice, add ice, and shake until chilled. Strain into a chilled Champagne flute, top it with chilled Champagne and garnish it with the star fruit.